PHOENIX – I was 97 percent done with a column saying the Patriots needed Rob Gronkowksi to poop or get off the pot. Something had to give between the 29-year-old tight end and the team, I wrote. Before I saved and hit send, something gave. It was Gronk. Ironically, he gave because he really had nothing more to give. The game became harder for him to enjoy for a variety of reasons the past few years. He'd felt financially taken advantage of since March 2016 when the Patriots picked up the final four years of his contract. He felt humiliated when he was chastised during the summer of 2017 for being weak and feeble as he came back from back surgery. He felt hurt when the Patriots considered trading him during the 2018 offseason as he was in the midst of a mini-walkout and he felt taken advantage of when the Patriots laid a bunch of financial carrots in front of him before the 2018 season and he didn't hit a single one of them. But more than all of that, he just didn't want to do it to his body anymore. After the Super Bowl in Atlanta, I waited near Gronk's locker so I could get some kind of indication whether he was all done. He'd already told the scrum he wasn't making any announcements but I wanted to hear it directly so I waited. He saw me and – standing there in his jock, jersey and shoulder pads – he waved me closer and said, "Look at this." I looked at the side of his thigh where he was poking. It looked stupidly big. Swollen from just above the knee for about 20 inches. The misshapen thigh was caused by second-quarter hit on which Gronk was sandwiched and upended. He limped to the sideline and the limp got worse when he got into the bench area. He didn't miss any plays which -- given the way the thing looked now -- was kind of amazing. "Is that the worst you've ever had?" I asked him, figuring it probably was because the expression on his face was somewhere between mortified and amused. "No, it's about the same as other ones," he said. "But I can barely walk!" "What will it look like tomorrow?" I asked. "It will be red . . . black and blue," he said. "But at least I don't have to worry about it now." The implication there was that there would be no game the following Sunday to get ready for. Now we find there won't be another game, period. During last season it became clear that Gronk's retirement talk wasn't a ruse or a ploy for more dough. He was melancholy for a chunk of the year, bummed out because his body was getting dropped from the roof every Sunday, patched together all week then hoisted up to the roof for another dropping seven days later. Three days before the Super Bowl I asked Gronk how "fun" the 2018 season had been and he swerved, saying it was a hard year. "To tell you the truth, just try and imagine getting hit all the time and trying to be where you want to be every day in life," he said. "It's tough, it's difficult. To take hits to the thigh, take hits to your head. Abusing your body isn't what your brain wants. When your body is abused, it can bring down your mood. You've got to be able to deal with that, too, throughout the season. You gotta be able to deal with that in the games." Meanwhile, the Patriots needed a decision out of him. They wanted to hear from him before free agency opened. They didn't. So his $12M cap hit was clogging up the salary cap and, reportedly, free agents like Jared Cook were passing on coming to New England because they didn't know what their role would be relative to Gronk. 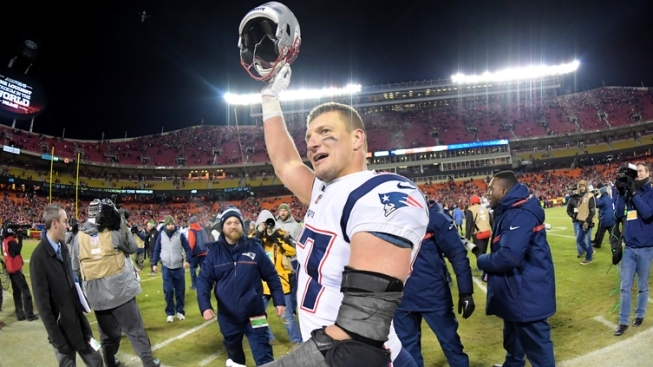 Gronk wanted to see what the Patriots were planning before he made his decision, his concern being that – if they didn't do anything of consequence – he'd be ridden like a rented mule every single week like he was in 2018. It wasn't hard to empathize with Gronk's viewpoint. Coming off a dominant 2017 season in which he had 85 catches for 1,382 yards and 11 touchdowns in 17 games (including playoffs), the punchless Patriots offense went into the 2018 season with exactly one established pass-catching threat in their offense. Gronk. Defenses reacted predictably. Everybody covered Gronk. He had seven catches for 123 yards in the opener but back and ankle injuries soon cropped up and the blame for the Patriots' lethargy was laid at Gronk's feet and a couple months of "What's eating Gronk?" conversation followed. The general conclusion? He wasn't good anymore. That would have required an impossibly precipitous drop from the opener and the 2017 season, but it was gobbled up and regurgitated regularly. Meanwhile, the following tight ends entered the NFL in the past two drafts: Hayden Hurst, Mike Gesicki, Dallas Goedert, Mark Andrews, Jordan Akins, Ian Thomas, Chris Herndon, Evan Engram, O.J. Howard, David Njoku, Gerald Everett, Jonnu Smith and George Kittle. The Patriots spent a seventh-round pick on Ryan Izzo. The only depth behind Gronk these past two years has been Jacob Hollister, Dwayne Allen and Martellus Bennett for a cuppa coffee. The Patriots hadn't done anything to bolster the position, relying on Gronk to be a one-man gang both as a blocker and a receiver. All the while, he felt taken advantage of with a below-market contract that paid him half what less-impactful players at the wide receiver position make. The kicker to it all was that when the Patriots gave him a financial bump last year, they made it all incentive-based and he didn't hit a single one of them. So, the way Gronk saw it, why did he need to do the team a solid to rush back with a final decision? The offseason could have played out with the Patriots making no headway toward improving their offensive personnel (and they are off to a slow start) and Gronk becoming that much more valuable. Then he'd have leverage to demand a real deal, not just a bunch of dangling carrots like he got last year. He didn't do it. He got out of the way. Part of me doesn't completely buy this is the end. He's 29. After a year away from the game, when his body's feeling rejuvenated and he realizes a life without the rhythms of football is a world he wasn't ready for, maybe he comes back. Or maybe Willie McGinest was on to something when he said a few weeks back he could see Gronk taking "a break for a while" and returning "deep in the season." Neither would surprise me in the least. If this is it, though, the on-field legacy Gronk leaves is unique. If you line up the all-time greats – Mike Ditka, John Mackey, Dave Casper, Russ Francis, Kellen Winslow, Tony Gonzalez, Ozzie Newsome, Jason Witten and Antonio Gates – not a single one of them can be put ahead of Gronkowski without a spirited debate. None blocked and caught better. And none of them was a better big-game player at the position. All stats aside. Off field? He remained the same person he was when he was drafted. A big goofball. A clumsy yellow lab who would bound into the room, knock over a vase with his tail, track mud on the rugs and run through the screen. But you couldn't get mad at him. There truly wasn't a mean bone in the kid's body. Did he do some dumb stuff? Yes. Spearing Tre'Davious White was rotten. Hanging with Bibi Jones caused people to blush and he had to apologize to Robert Kraft (ironic!). He wondered whether Obama was drunk back at the White House early in 2015. The stage-mothering sometimes done by Gordie Gronkowski was eye-rolling. But every time there was a misstep, a chastened apology followed. And every time there was adversity, a certain vulnerability followed too. And every time you got exhausted by Gronk's business decisions, you also remembered that he came into the NFL with a fused back and a short life span and you kind of understood. Gronk proved a 6-6, 260-pound behemoth with muscles on his muscles, a so-so command of the King's English and the sense of humor of a seventh-grader could become an icon by never being anything but himself. Damn lucky to have him.